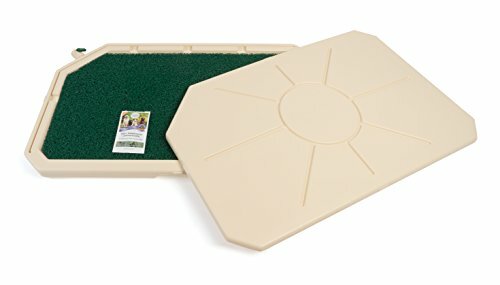 How do I train my dog to use an indoor dog potty? What different types of indoor dog potties are there? If you spend your days at work worrying about whether your doggie friend can hold it until you get back home, then perhaps an indoor dog potty could make your life a little easier and put your mind at ease? Placing an artificial grass patch for dogs (or another type of pet toilet) somewhere in the house gives them an assigned space to go if they need to do their business while nobody is there to take them out; and while it might take some time to teach a dog to use indoor pet potties, dogs are intelligent animals and they will get the hang of it if you are patient. Indoor dog bathroom solutions are also great for rainy days, and especially for those dogs that refuse to set foot outside when it is wet or cold. There are a few different dog potties to choose from, which makes it easy to find the best indoor potty for dogs in your household. Related: Best Pooper Scoopers for Dogs. 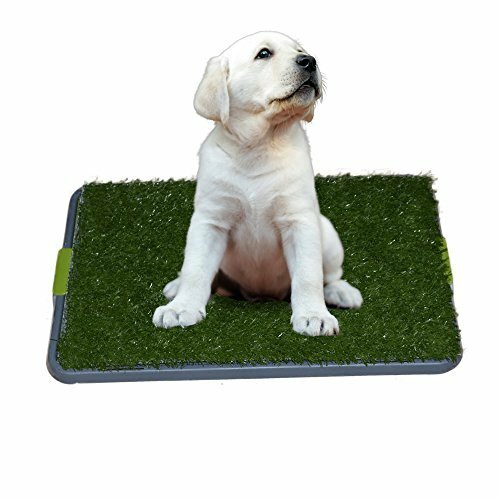 This indoor dog potty grass has a sealed bottom compartment which efficiently catches urine and any unpleasant odor so that your home remains fresh and smell free. A quick-drain spout is used to empty the reservoir, and you just unscrew it and empty the dog toilet through there, so that you never have to touch any of it with your bare hands. To clean the below tank – just connect a hose to the spout and let it do the dirty deed. 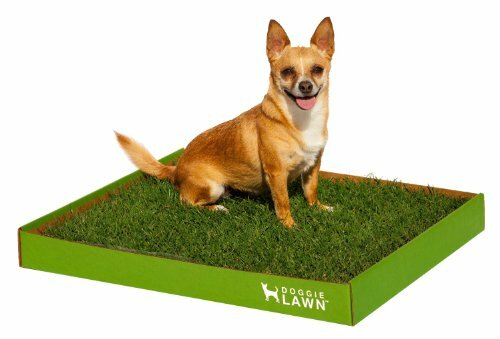 The grass looks and feels realistic, and small holes allow for any dog urine to go straight through and gather in the sealed compartment, and there is an included lid for easy transport and for when the dog potty is not in use. 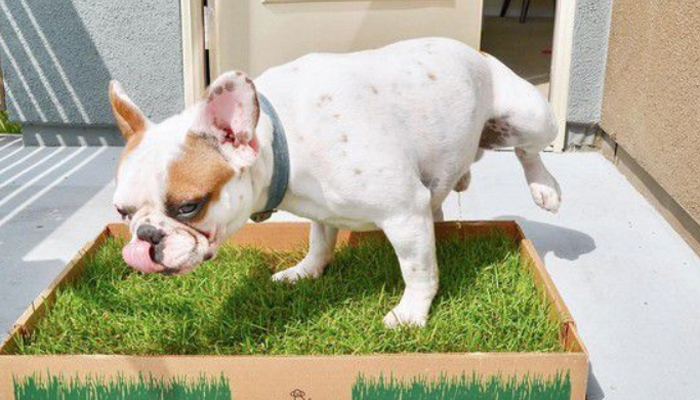 Why We Like It – For dogs that are just learning to use an indoor dog toilet, this product with artificial grass might help them figure out what they are supposed to do a little faster since they are used to doing their business on the grass outside. The clever design of this indoor potty for dog households allows you to use regular disposable puppy pads, without having to worry about your naughty pup chewing it up, playing with it or dragging it around. 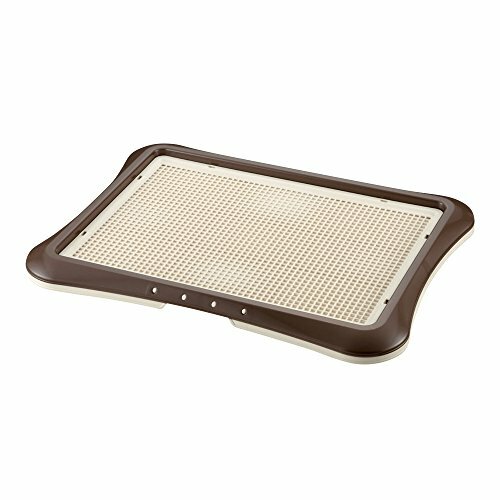 The layered construction has a solid plastic base tray, on which you place the disposable puppy pad (can be purchased in most grocery stores, pet shops and online). You then secure it with a top grate with perforated holes for the urine to filtrate through and down to the puppy pad. The benefit of this is that your dog will not be stepping directly onto the pad – eliminating the risk of him or her stepping in their own urine and leaving wet paw prints all over the house. Why We Like It – The genius of this dog indoor potty lies in how simple its construction is; yet how much easier it can make to potty-train your pup. A disposable puppy pad can be tempting to play with and/or tear apart, and this Klean Paws indoor dog potty eliminates the potential issue completely. It is always important to try and care for the earth we live on, so why not try this biodegradable, stylish and disposable pet pottie with real grass? No artificial grass like you might find on other products, but real and hydroponically grown pasture, which naturally attracts your dog to walk over and do his or her business. It is great for young puppies since it teaches them right away to pee on grass, and you avoid confusing them with plastic products and paper pads. The fresh smell and the complex root structure absorb urine and contain any bad odors, and it is both lightweight, long-lasting and affordable. 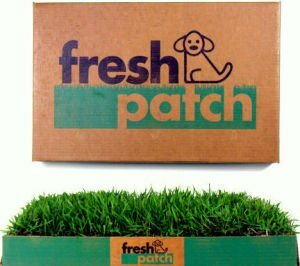 It is ideal for small and medium dogs, and two Fresh Patch products can be joined together for those with larger dogs. Why We Like It – An indoor dog bathroom has many benefits, and why not go with a more natural alternative with real grass? These require no cleaning and are simply replaced when you feel it is time. Teach your dog to go to the bathroom on one of these indoor dog potties and save yourself both trouble and money. It is made with a base tray and two fitted grates to make sure your pup never steps in his or her own urine, and you can add a layer of newspaper or puppy wee pads in between the grates for additional absorption capacity. When your fur friend goes number two, you can just lift the top grate and drop the waste into a doggy waste bag. With an indoor doggie toilet like the UGODOG, you no longer have to stress when trying to make it home through the 5-o’clock traffic; worrying about your dog needs to go outside. Clean, mess-free and easy to use, it is an indoor potty for dogs to relieve themselves when their human family members aren’t there to take them for a walk. Why We Like It – A great benefit of this indoor pet potty is how easy it is to clean, since it is entirely made of plastic. You can use the hose to rinse it off, leave it in the sun to dry for a couple of minutes and then it will be as good as new. Perhaps you don’t have the time or the will to clean an indoor dog litter box or other indoor dog pee area, but you might still want an eco-friendly option? If so, then this bio-degradable and disposable inside potty for dogs could be the solution you have been hoping to find! It has real grass growing in a cardboard box, which keeps this indoor pet bathroom odor free and clean for a long time. When you feel it is time for a switch – you simply throw it out and replace it, with no cleaning required. 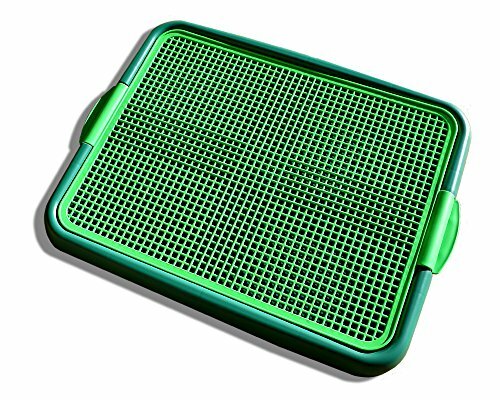 You might have read a dog potty grass review about the DoggieLawn dog potty system before since it is a very popular product among environmentally conscious dog owners. Why We Like It – While an indoor dog potty area can be a great help for busy dog owners – it can also be time-consuming to clean it regularly. This can be resolved by using disposable products, and by using an all-natural grass product like the Doggie Lawn Dog Potty – you also get a chance to do something for the earth we inhabit. This is the best indoor dog potty system for the dog owner who wants a reusable product that is easy to clean. 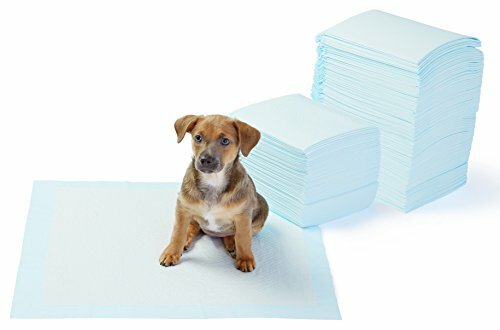 While most puppy pads are disposable, this clever invention is a washable indoor dog pee pad that can be washed in the washing machine when getting too stained. It has 4 absorbable layers and a waterproof bottom, to make sure nothing leaks out on your floor. By using a product like this, you get all the benefits from regular pee pads, but you save money since there is no need to replace it, and you are also doing something good for the environment. 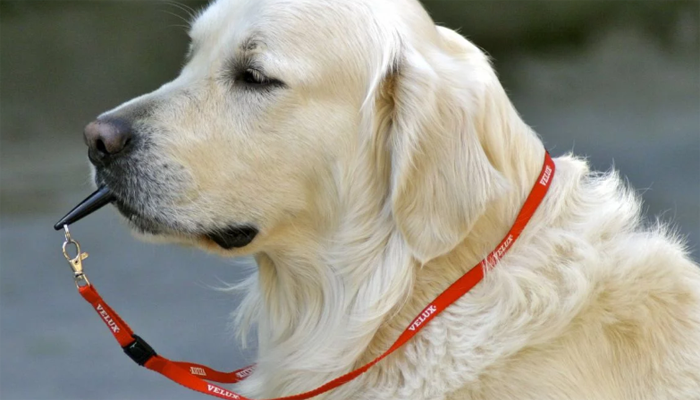 Less waste is a step towards more sustainable dog ownership. Why We Like It – Get these indoor doggy potty pads for young puppies being housetrained, or for older dogs to use when you are not home. These can also be used for child bed wetting, for example, and are both versatile and eco-friendly. When buying these puppy potties – you get two indoor doggy potty pads, so that you always have a fresh and clean one to lay out while you wash the other. The breathable and waterproof material helps retain urine and contain any smell and odor, and the ultra-absorbent inner layer keeps the pee where it needs to be. It is an indoor puppy potty that is perfect for doggy households where the environment is an important question, and where time might be an issue when it comes to cleaning and replacing. You just throw the pad in the washing machine or wash it by hand, depending on your preferences, and use the other in the meantime. Why We Like It – These indoor dog potty training pads are large and spacious, which is perfect for a dog to give them the space they need to comfortably do their business. If you have a favorite color that you would like to decorate your home with, then one of these colorful inside dog potty trays might be the best indoor dog potty for you! It comes in brown, green and pink, and it will make housetraining a lot easier since it is made to hold pee pads in place and prevent them from sliding around. You no longer have to worry about coming home to a chewed-up pee pad, since this practical snap-in frame holds the doggy pads right in place. 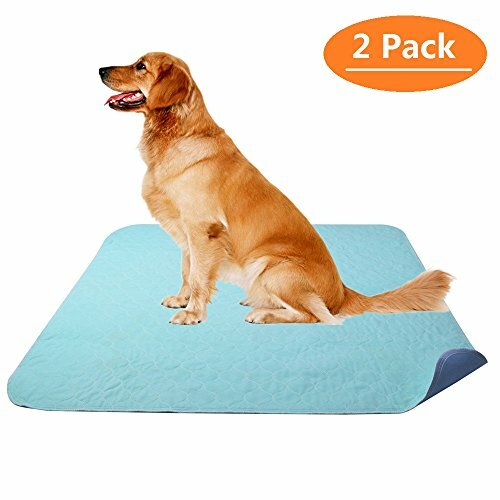 It is comfortable to step on, has drainage holes that allow for your dog’s toilet needs to go straight through the upper layer and down to the absorbent pad (or newspaper), and it is easy to clean with water and soap. Why We Like It – The best thing about this product is the option to choose between three colors! Indoor dog potty solutions shouldn’t have to be boring, and with one of these indoor potty trays – you get to pick the color that will look the best inside your home. 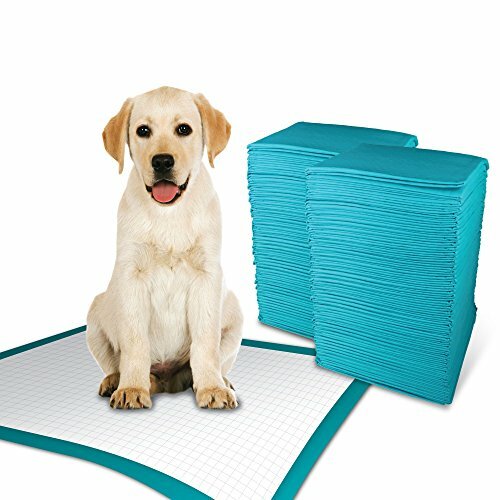 These extra large and extra absorbent puppy indoor potty pads are easy to use, sold in packs of as many as you think you need, and they are disposable so that you don’t have to worry about cleaning. 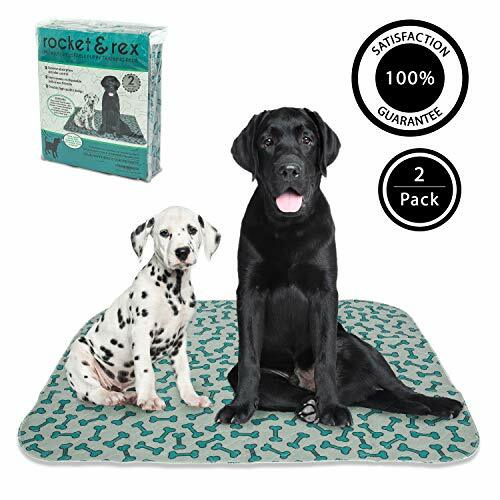 The improved design and materials make them more absorbent than ever, even for big puppies and adult dogs, and your floors are safe as long as you change the pad regularly and as needed. It can hold up to 7 cups of liquid, however, so you really won’t have to worry if It takes you longer than usual to get home from work one day. Why We Like It – Make it simple with these dog indoor toilet pads, and just replace them as needed when you think it might be time. Much more absorbent than many similar products and sold in practical large packs. Choose between the regular size and extra-large dog potty indoor pads and get a size that fits the needs of your dogs. Some dogs like to turn around a few times before doing their business, or perhaps they tend to look for a clean spot before hunching down, and then the largest size might be an option worth considering. By using these for your indoor dog potty station, you never have to worry about your floors getting wet thanks to their superior soak-up ability. The pads are sold in big packs for your convenience, which means you don’t have to run out for more every single minute (puppies have a habit of going through wee pads quite fast). Why We Like It – By setting up an indoor potty area for dogs, you give them a place where they can do their business even when you are not home. These pads are affordable and come in large- and long-lasting packs so that your floors are covered (and protected) at all times. 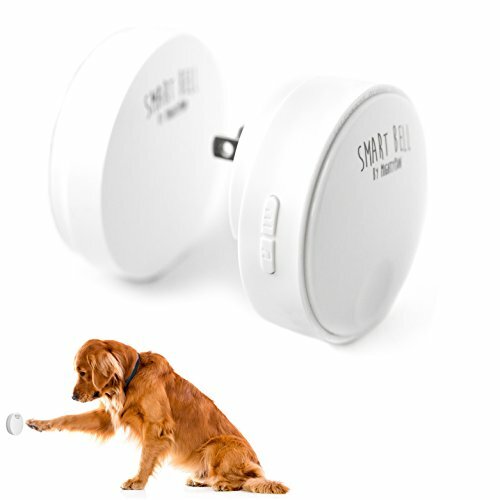 This fun product is a little doorbell for dogs, that is easily mounted on the wall. It requires no batteries or wires, and if you teach your dog to push it – he and she can let you know when a trip outside is needed. 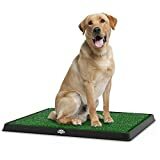 It is waterproof so that it can be used both indoors and outdoors, and large enough (and easy to push) for your dog to easily learn to hit the mark. The product comes with an activator and a receiver, which can be placed up to 1000 feet apart when used inside the house. Its an easy trick to teach, and once your pup knows what to do; there will be fewer accidents at home since you will know when it is time for a run around the backyard. To get it right when shopping for indoor pet potty systems, it is mostly a question of knowing your options, understanding what makes them different and deciding what would work best for you and your pups. 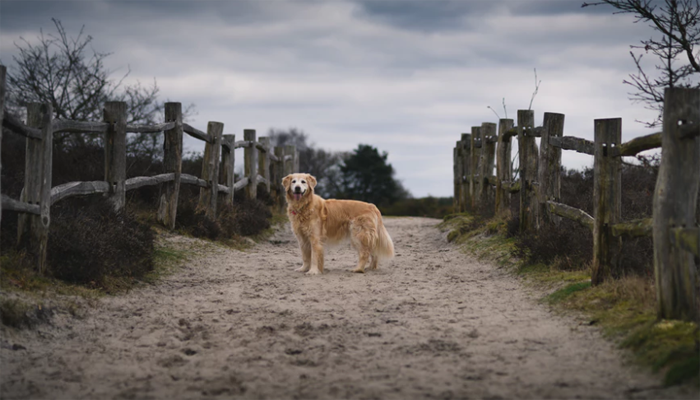 There are a couple of different options to choose from, which differ in both function and purpose, so let’s have a look at a few of the factors worth considering when trying to find the best potty patch for dogs. An indoor dog potty review can help further in the decision-making process, but it all comes down to what works best for your family. Most puppy parents have heard of regular and disposable puppy pads – these thin but absorbing soft pads you can buy in most grocery- and pet stores and that work to soak up dog urine and keep it from damaging your floors. 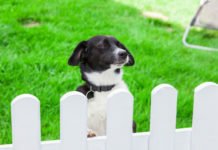 It is a great way to train a young dog not to pee all over the place and to give him or her an assigned area for where they can do their deeds. Once one of these gets stained enough, you just throw it in the trash and replace it with a new pad, which means there is no need for additional cleaning or scrubbing. Reusable pads are made with materials that can be cleaned; most commonly fabric. These have a waterproof bottom to make sure nothing soaks through and down to the floor, and a middle layer to absorb moisture and trap it there. In most cases, these can be washed in the washing machine and reused many times, which saves you money, while also helping the environment. It is the best dog potty solution for pet families that want to do their fair share for the earth. 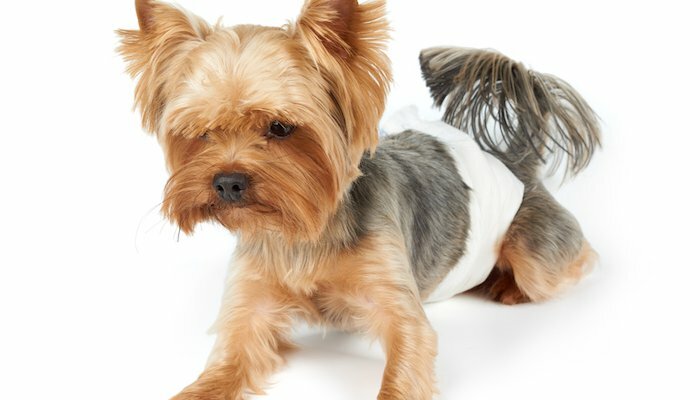 A pad holder is designed to keep a regular disposable puppy pad in place and to make sure your dog won’t play with it, tear it apart or cause other damage. There are different models, but the idea is usually that you place the pad (or newspaper) on a tray and lock it in there with a top layer with perforated holes. Urine will then go through the holes and down to the absorbent material, and the bottom tray will work as a security layer to guarantee that nothing goes through and ruins your floors. This combination makes excellent indoor toilets for dogs, that will keep your home pee free. To avoid confusing your dog, you might want to consider getting the best dog grass potty for your pup! With an indoor dog potty system based on an outdoor environment, it can become easier to make your dog understand the relationship between the different places where they are allowed to pee, which in turn can come to speed up the learning process. You can either get a fake grass indoor potty dogs are sure to love, and which can be cleaned using water and some soap. 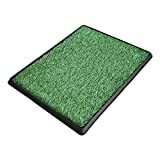 This variety is reusable, and the artificial grass pad resembles real grass. The other option is real grass pads (often praised in indoor dog potty reviews), grown in a cardboard box. These are replaced after a certain time; and since the product is eco-friendly and biodegradable, you won’t have to worry about harming mother earth. An indoor dog potty or an indoor bathroom for dogs is an assigned area where your pup is allowed to carry out their needs, and where they know they won’t be punished for peeing or doing a number 2. It is convenient when leaving dogs home alone for more than a couple of hours when house training a puppy and for dogs with a seemingly small bladder – that can’t seem to hold themselves for too long. If training a puppy, you want to be moving your tiny friend to the pad every time it seems like he or she might want to pee. You can see this if the puppy starts sniffing around; especially after meals, sleep, and playtime, and you then simply place them on their pad, and if they pee – you give them plenty of verbal praise and encouragement. Another trick is to let the pad soak up some misguided pee (if, for example, your puppy pees on the floor) so that the pad will smell like their own urine for the next bathroom break. Dogs tend to pee where they have peed before, so it is a smart way to speed up the learning process. Just remember to be patient, and to never punish your dog for making a mistake. Instead, praise them when they get it right. There are so many different dog potty solutions, and you will have to decide what you think could be right for you. There are disposable pee pads, reusable pads, pad holders, artificial grass pads and real-grass pads, and you can read more about them in the Buyers guide above. Providing your dog with an indoor dog potty is helpful for you as an owner; since it takes the pressure off when being out running errands or on rainy days since you know your pup has somewhere to pee, but it is also immensely helpful for a dog. 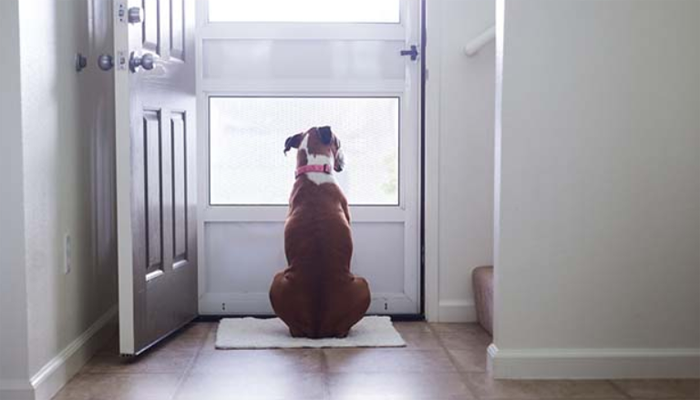 Many dogs feel terrible when having to pee inside, especially when housetrained, so for a dog to be left alone for too long without an assigned place where they know they can do their business can be close to cruel. With an indoor bathroom for dog family members living under your roof, you no longer have to worry about your pup peeing where he is not supposed to, or about him suffering because you didn’t make it home in time. Prepare yourself to be patient when teaching your dog to use an indoor dog potty, since it can take a while for some dogs to learn. Many dogs are surrendered to shelters due to problems with housetraining, where the real issue is that the pet parents weren’t prepared for a dog, or that they didn’t have the patience that raising a dog requires. A properly used indoor dog potty can help with a difficult stage in a pup’s life, and continue to be useful throughout the life of the dog.